LONDON — Alexis Sanchez kept alive Arsenal’s fading hopes of qualifying for the Champions League as the Chilean broke Sunderland’s stubborn resistance to seal a crucial 2-0 win on Tuesday. 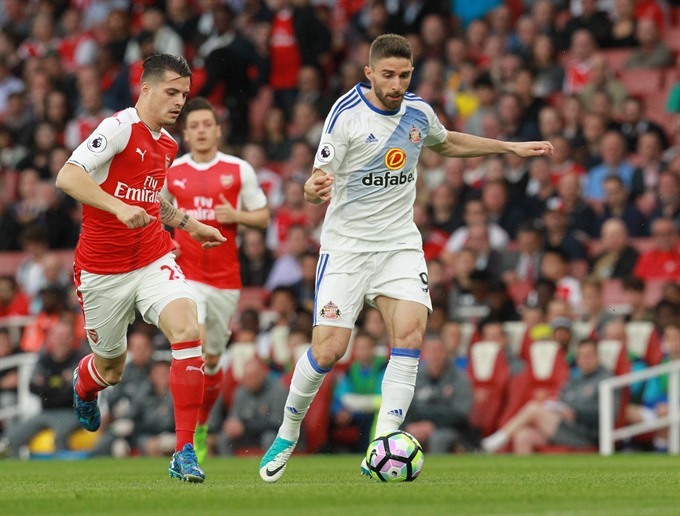 Arsene Wenger’s side were struggling to see off relegated Sunderland until Sanchez came to the rescue with two goals deep into the second half at the Emirates Stadium. Despite refusing to sign a new contract, Sanchez remains the only Arsenal player consistently performing at a world-class standard and the former Barcelona forward, playing despite a recent thigh injury, is the sole reason they still have a faint chance of a top-four finish. In reality, the fifth-placed Gunners need a miracle to qualify for the Champions League for a 20th successive season. Arsenal’s sixth win in their last seven games moved them within one point of fourth-placed Liverpool, but there was bad news from Eastlands where Manchester City beat West Bromwich Albion to retain their three-point lead over Wenger’s team. Arsenal host Everton on Sunday, while Liverpool entertain relegated Middlesbrough and third-placed City travel to Watford. If Liverpool win and City avoid defeat, Arsenal will miss out on the Champions League for the first time in two decades, even if they end the season with a victory. Wenger’s approval ratings are at an all-time low with Arsenal’s disenchanted supporters and it will be fascinating to see if he decides to stay if the top four proves beyond reach. Wenger had urged fans not to boycott the Sunderland fixture in their latest protest against the Gunners boss, but when the Frenchman emerged from the tunnel before kick-off he was greeted with swathes of empty red seats around the Emirates. Sanchez thought he’d given Arsenal an early lead when his 20-yard strike flashed past Sunderland goalkeeper Jordan Pickford, only for a linesman’s flag to curtail his celebrations. Olivier Giroud was the culprit after flicking the ball goalwards with his arm, and the Arsenal striker wasted a chance to redeem himself moments later when his close-range effort was pushed away by Pickford. Wenger moaned this week that Arsenal’s top-four rivals were benefiting from playing teams with their minds already on their holidays, ignoring the fact the Gunners enjoyed victories over a Manchester United side more concerned with the Europa League final and a Stoke team with nothing to play for.